As we reflect upon 2013, we look back on a year of memorable events in the Stowe area. Highlights include the completion of Stowe’s brand new ice arena, Stowe and Waterbury celebrating their 250th birthdays, and Morristown breaking ground on the new Rt. 100 by-pass. 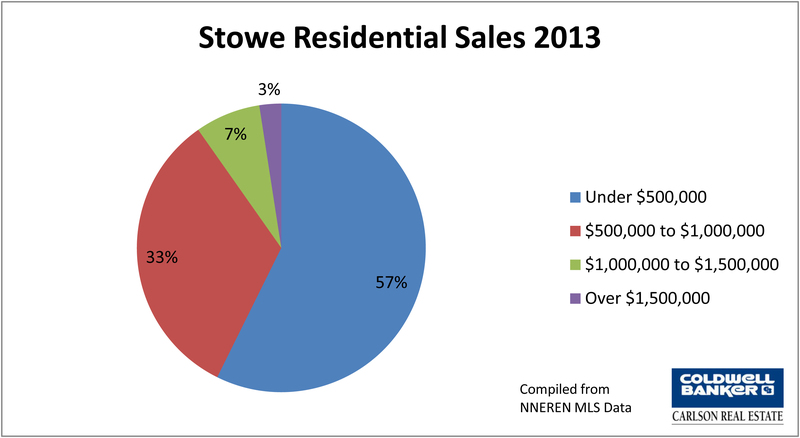 Most of the home sales in Stowe, 57%, were under $500,000. The second leading category was $500,000 to $1,000,000 making up 33%; and the balance of sold properties was $1,000,000 and above. The highest priced home sale for 2013 was the resale of the HGTV “Dream Home” up at Spruce Peak, which sold for 2.7 million, back in April. 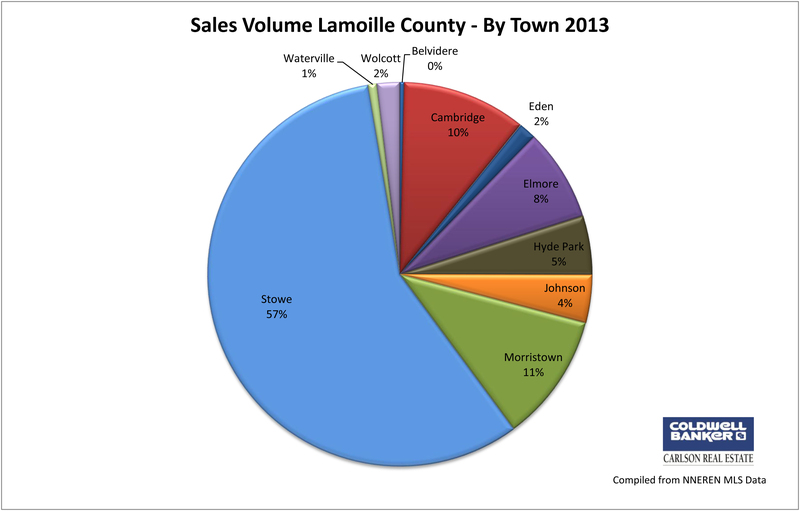 Outside of Stowe, the rest of Lamoille County saw a large increase of residential sales in 2013 as well – up 36%. 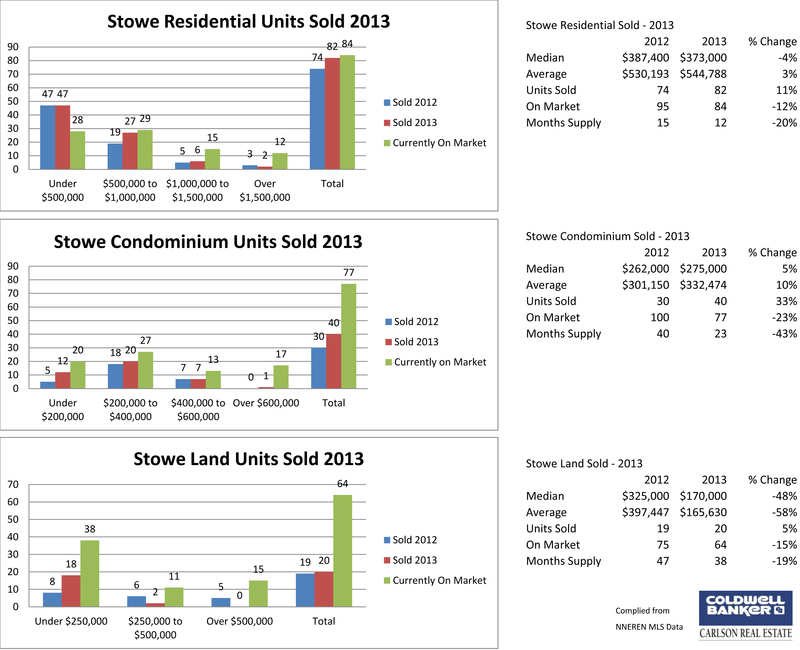 The total number of homes sold in the County (excepting Stowe) was 160, compared to a total of 118 the year before. The median sales price increased 2%, and the average, 5%. 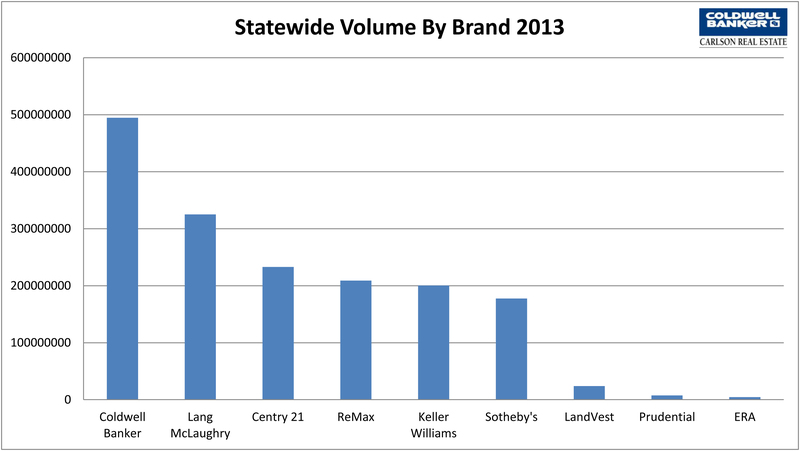 The number of Land sales was the same as the previous year, and the amount of inventory remained almost unchanged. The majority of the home sales, 53%, were under $200,000. 36% were in the $200,000 to $300,000 range, and the remainder, $300,000 and up. 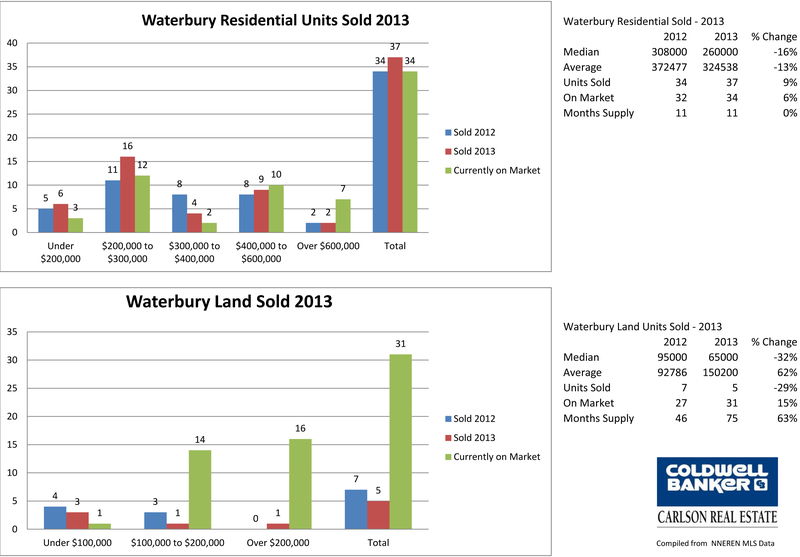 Waterbury residential sales also increased nicely, at a rate of 9% from the previous year. But the median price slipped 16%, and the average, 13%. 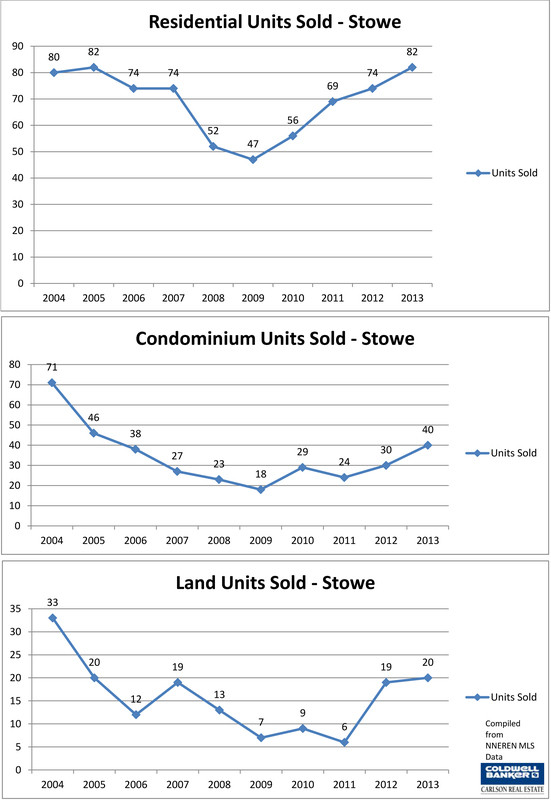 Although Waterbury has the least amount of Inventory than Stowe and the other towns in Lamoille County, supply increased 6%, from 32 residential listings to 34. There was no change in the number of month’s supply. 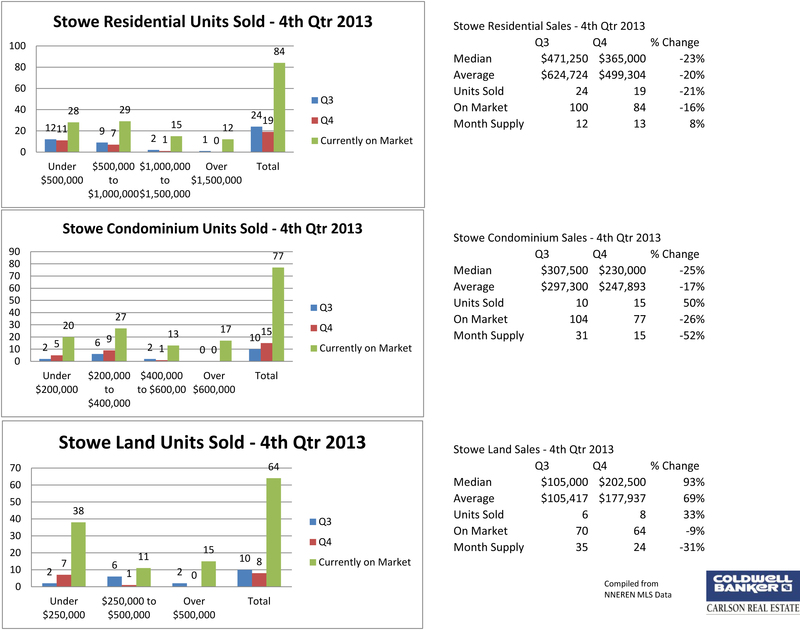 As for land sales there, the number of closings fell 29%, but that was for only a total of 5 sales. 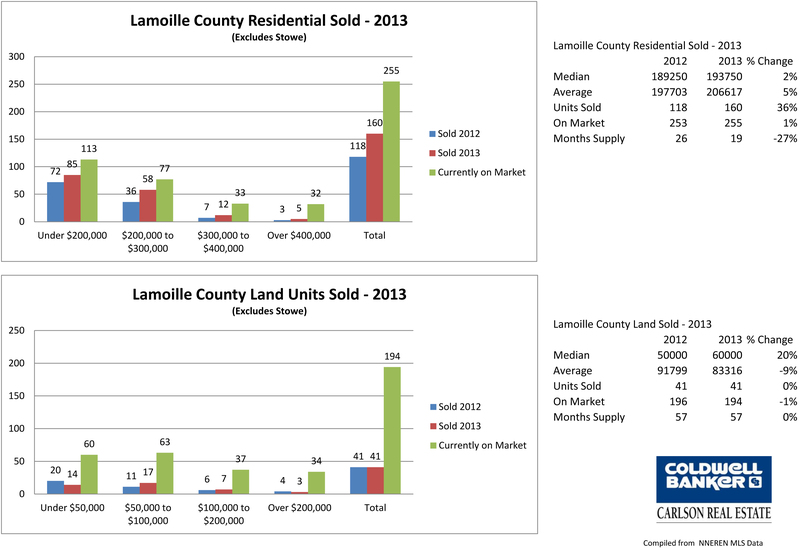 The inventory for land listings increased by 15%. The median sales price dropped 32%, while the average went up 62%. I look forward to another busy year of assisting buyers and sellers with marketing, purchasing and sales; and based on the activity we are already seeing this January, I am confident that the market will continue to show signs of improvement, strength, and an overall increase in sales.